When most people think of a magic show this is what usually comes to mind. It is a larger show suitable for larger audiences. This would be the type of show expected after a nice dinner when the magician is "given the floor". I combine clean comedy and magic with lots of audience participation. There is no vulgarity in my show and although I may have a little fun with people, I DO NOT humiliate my volunteers.No one on stage does anything I'm not willing to do myself! In fact, it is often my volunteers who come to me after shows and thank me for the show. Many of my clients will have strolling magic before a Parlor/Platform show as a way to warm up the audience. Do too many people walk by without looking at your trade show booth? Let my talents with close up magic get the attention of your customers. Not only will people enjoy a personal show, they will also get "a brief word from our sponsor" before the dramatic conclusion of the effect. Some may also get a magical souvenir with your company logo on it. Definitely something they will remember! All of the routines in my Family/Kids Shows are age appropriate. Many of them involve the audience and any theme you may have for your event can be incorporated into at least one part of the show. A little zaniness included! These productions are ideal for staff children's Christmas parties, fundraisers, Just Say No clubs, children's festivals and can even be scaled down for special events you may have in your home. 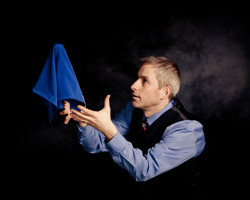 Many clients will have strolling magic prior to a large family/kids show to warm up the audience. During strolling magic I perform close-up illusions while mingling with your guests. Small props such as cards, jewelry, elastics, etc. are used to perform short magic routines directly in front of a few people at a time. This works well during banquets, (either while guests wait for their meal, or near the end of the meal during dessert) cocktail hours, grand openings or any time guests are mingling. I can even incorporate a message such as "Happy Birthday", "Welcome to our Store", etc. if you so desire. I have found that strolling magic prior to a parlor show provides a great opportunity for your guests to meet me and really warms up the audience for the show to follow. Want to get your entire audience involved in the show? Want a great way to incorporate your company name or conference theme into the show? Well, with Super Ron's Bingo now you can! Great for weddings or any event where you want to emphasize a particular theme. Bingo cards, custom printed especially for your event, are given to the entire audience. A generous prize is offered and everyone in the audience has a chance to leave a winner! Super Ron's Bingo is a great addition to any show.